It is time to start planning your Christmas cookie list, isn't it? Today's cookie is truly a five star keeper!! 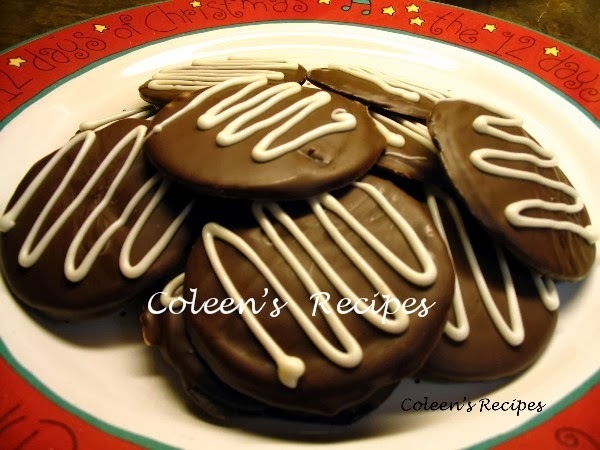 These festive cookies taste just like Thin Mint Girl Scout Cookies(only better!!) and they only take TWO INGREDIENTS to make!!! People will think you've been working on them all day. can use holiday sprinkles instead. 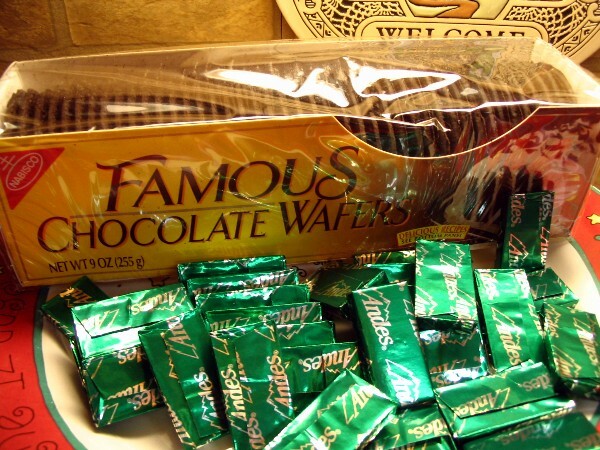 You will need some Nabisco Famous Chocolate Wafers and some Andes (creme de menthe) chocolates.....that's it!! The chocolate wafers come in a 9 ounce package and I found the Andes Mints (those creamy little chocolate mints with the green center) in a 4.67 ounce package. There are 28 mints in the package and one package will do a dozen cookies (I found the mint packages for $1.60 here in Alaska, so hopefully you can find them even cheaper. I unwrapped and then melted the chocolates in my microwave for about 30 seconds...stirred and then microwaved them for another 10 seconds (stir until the chocolate is smooth and shiny). Dip the chocolate wafers in the melted chocolate (both sides) and place on some parchment paper (or waxed paper). Stick them in the fridge (I used the freezer) for about 5 minutes to "set" the chocolate......that's it!! NOTE: If you are having trouble finding the Andes Mints, just use the Andes Mint baking chips (next to the chocolate chips) they will work just as well.